So it’s time to catalogue some of the tremendous meals I’ve been having in Malaysia, in case anyone else likes Malaysian food and may even venture over. I already mentioned the great curry noodles I had in Cafe Kopitiam in the Pavilion (my new fave KL mall), and the fab satay and kway teow on Jalan Alor. The night after I ventured out to little India (and yes I got a little lost). 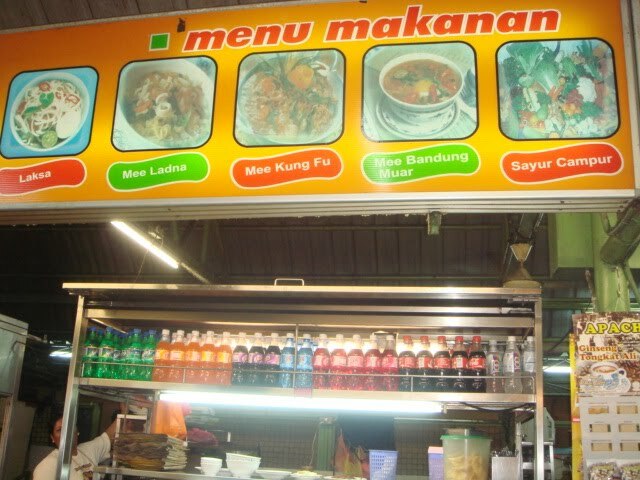 I found a groovy little night market eatery that again was kind of open air in that it had no real walls; it was like an outdoors food court of Malay, Indian and Chinese food. The place I chose had a woman running it, and females eating there. You don’t always want to be stared at by a bunch of men, and the stall to the right had a bunch of Indian men doing just that. Above is a pic of the place, and as I’d resolved to have something new, I looked up and saw ‘Mee Kung Foo’ – and ordered it. My, was it delish. 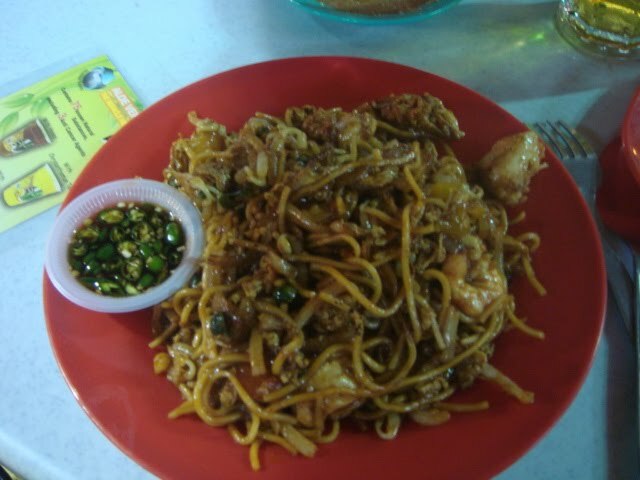 Seafood, fresh veg, really crispy fried shallots and a lovely mild sauce like chow mein. In my last 24 hours in KL I went back to the Golden Triangle/Bukit Bintang area. 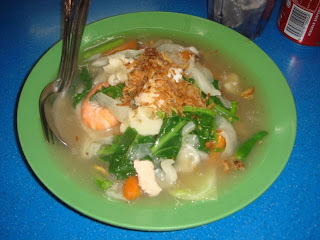 For my last dinner there I returned to Jalan Alor, and sat at the stall next to the original one I ate at, called Yan’s. 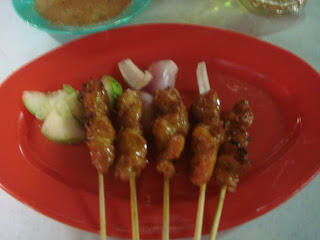 Yes, I had satay again, and also had a noodle dish that wasn’t kway teow but was very yum. It had prawns, chicken and squid in it and I admit I picked out the green chilli. 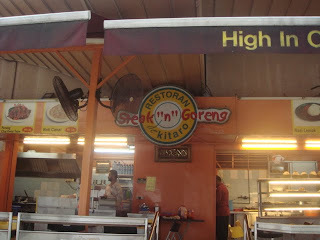 I had lunch at a place in front of the Bukit Bintang Plaza, called BB’s Bistro – there was a place nearby called Restoran Kitaro I was looking at, but all the tables were full!. 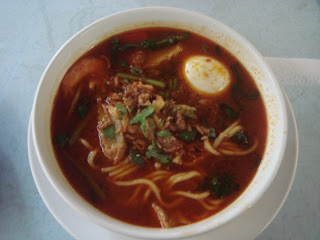 Anyway, I had a spicy soup dish with noodles, egg, tofu, chicken etc which was so nice that I wasn’t going to eat it all initially but i did 🙂 I had a lovely teh tarik also (which is strong, sweet milky tea that’s been poured from a great height back and forth til its frothy). 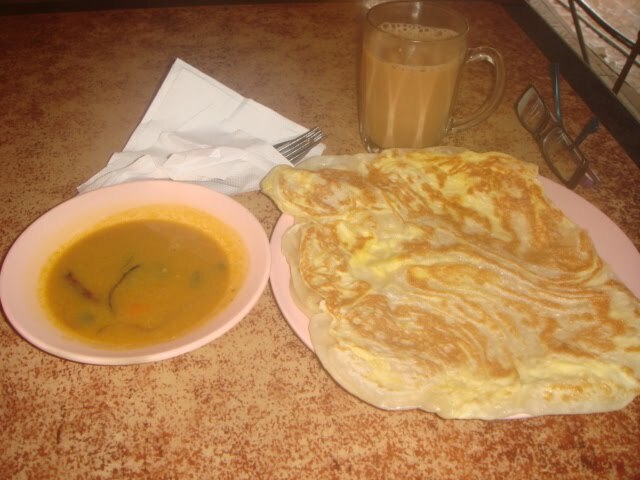 So next day for brekkie I went to Restoran Kitaro and had a delicious Roti Canai and Teh Tarik (yes, I AM addicted to TT). My first night in KL Kuala Lumpur.